But what if there’s no difference? No patented process, no unique carbon micro-fibers, no bitchin’ flame decals on the side. What if the competition is putting out the exact same product? Not possible, you say? 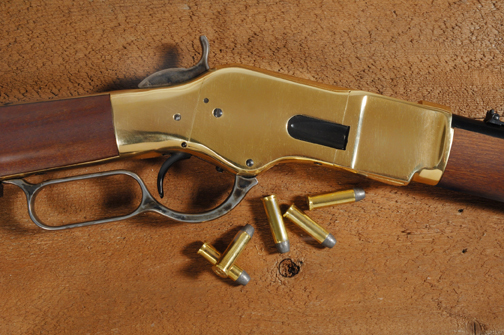 Welcome to the world of Old West replica guns; replica Colt .45’s, replica Winchester ’73 rifles, and so on. Now, there are several companies producing these replica guns that, by definition, are exactly alike. So how do you market them? And what if your writer (me) has never held a gun in his life? The answer, as always, is research. Who is your audience? It turns out, there is this entire subculture of dudes who dress up like cowboys on the weekends and have shootin’ matches. And, yes, their wives dress up as saloon girls. These guys are committed shooters and old west enthusiasts. So, it makes sense that they’re looking for a gun that’s not only well made, but also authentic. Second, just as important as the gun is the entire frontier culture. And here is where I planted the flag. I was determined to sell the romance of the Old West better than anybody else. Of course, I didn’t do it alone. The executive producer and sales rep were both big-time gun freaks. Their technical knowledge was vital, and allowed me to concentrate of spinning the Legend of the Old West. And the graphics are really evocative. Anyway, take a look here, * and give me your thoughts. *Well, shoot! (hey, good one!) They discontinued the line! You’ll have to make do with a brochure I wrote for them it’s on p.36 of my Print Samples. Web-addicted? Addiction is such a strong word. Let’s say I’m “web-dependent.” Sometimes, it’s unavoidable. Much of my clientele is elsewhere, so I am often waiting for some file to come over the wire. But, other times, when I am merely hitting F5 over and over to refresh the Yahoo entertainment headlines, I realize it’s time to yank the high speed line and get some work done. By Ken Levine: Prolific TV screenwriter and veteran of M*A*S*H, Cheers and Frasier holds forth daily on the art, business and frustrations of the Hollywood writing trade. Rotten Tomatoes: At ten bucks a pop, I don’t go to the movies without checking the Tomato’s aggregate scores compiled from dozens of film critics. I don’t always agree, but I do often enough. Also, when that charming little indie film you heard about finally hits Charleston (on DVD!) you can go back and dig up the six-month-old review before you head out to Blockbuster. Terrace Theater: If by chance that charming little indie DOES hit Charleston in first run release, it will most likely hit at the Terrace on James Island. And, they have a liquor license…how cosmopolitan! Politics: Bleh. If you must, try Real Clear Politics. It’s hard to find balance on the web, but this portal comes pretty close. Music: Other than iTunes, it’s the one and only woxy.com, one of America’s premiere sites for modern and indie rock. Once, when it was an FM station in Oxford, OH it was my only companion on my 90-minute daily round trip from Cincinnati to southeast Indiana. These days, I admit I am more of a fan of their old fart “vintage” feed. Moral Guidance: Pointe North Community Church, Moncks Corner SC. Cinematical & TV Squad: Sister sites that provide news, reviews and lively discussion about movies and television. Do me a favor…go there, find a loudmouth commenter called Cincinnati Mike…and please, tell him to GET BACK TO WORK! Welcome to A Lively Exchange, a blog about freelance web, print and video copywriting with a minor in video production. Michael Lively is an Addy-award winning copywriter who has made the jump from Ohio to Charleston SC and, as the tagline says, is trying to find his groove. This is not a forum for grand philosophies on writing or video production, but rather a way to hopefully generate some name recognition and search engine goodness. The author hopes you appreciate that sort of candor.